The Seahawks already face daunting odds to get the playoffs and now play the Rams, Green Bay and Carolina in the next three weeks. For so long the Seahawks had to search for slights to claim an underdog status to feed off of, such as the infamous draft analysis from Bleacher Report, which gave the 2012 class (Russell Wilson, Bobby Wagner, Bruce Irvin) an F.
“If that’s not an underdog, I don’t know what is,’’ Wagner said this week. Ill-informed draft opinions (and to be fair, most experts graded that class a little more favorably, putting it in the C range) are one thing. Point spreads and playoff odds — and the standings themselves — are another. As the Seahawks begin the second half of the season Sunday against the Rams in Los Angeles, all point to Seattle as being as big an underdog as at any time in the Wilson era. Seattle is a 9.5-point underdog against the Rams, which is the biggest number against the Seahawks in any game (regular season or playoff) since they were 10.5-point underdogs at Dallas on Nov. 6, 2011, a game Seattle lost 23-13 to at least make some people happy. That game is remembered as the day the Seahawks reconfigured their offense around the running game and Marshawn Lynch, beating the Ravens the next week to start a streak of five wins in six games that coincided with the Legion of Boom emerging as a force. The Seahawks haven’t been more than 7.5-point underdog since: In 2012 at the 49ers, in 2016 at New England and earlier this year at home against the Rams. Seattle memorably beat the Pats and beat the spread in the other two, and anyone who watches the NFL knows just about anything can happen. But as an indicator of what the public thinks — which is what the point spreads reflect as much as anything — it shows that the perception of the Seahawks is of a team that isn’t what it once was. What Wagner admitted to caring about is the team’s record, and what it says about the Seahawks’ playoff chances. 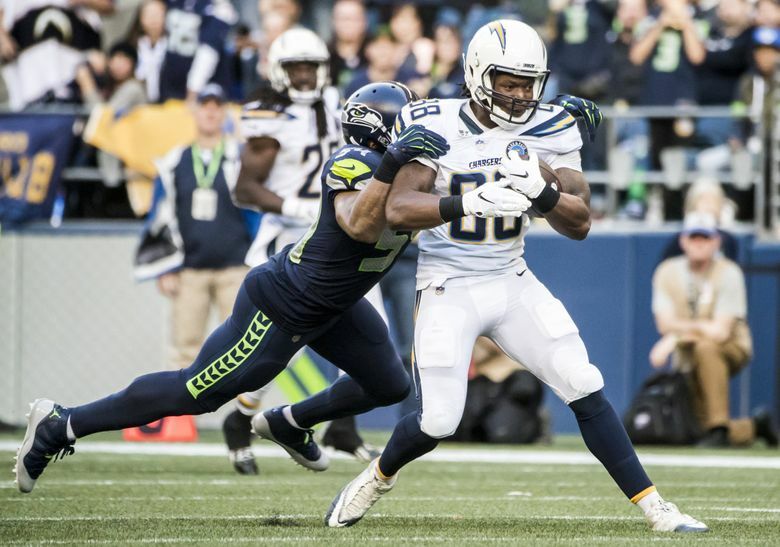 The loss to the Chargers last Sunday was brutal in that regard, ending the momentum of four wins in five weeks and leaving the Seahawks at 4-4. Sunday’s game begins a stretch of three of five against teams that would be in the NFC playoffs if the season ended today (Rams, Panthers, Vikings). Seattle would not be, standing at eighth in the NFC playoff picture this week. According to the popular analytics site FiveThirtyEight.com, the Seahawks’ playoff chances dropped from 55 percent before the loss to the Chargers to 34 after (increasing to 36 with Carolina’s loss to Pittsburgh on Thursday). A loss to the Rams would drop those odds even further, as low as at any time since 2011. Seattle was 4-5 after nine games in 2015, which you’ll hear a lot about if the Seahawks lose to the Rams. But that week, FiveThirtyEight.com listed Seattle’s playoffs at 37 percent with just six NFC teams having more wins than the Seahawks (and that 2015 team was a veteran group coming off two consecutive Super Bowl appearances). If the all the favored teams win Sunday, there would be eight NFC teams with at least one more win than the Seahawks. The Seahawks are tied with Atlanta and Philadelphia with the seventh-best record in the NFC at 4-4 (with Seattle holding the tiebreaker on the Eagles because of a better record in conference games, and losing it to the Falcons for the same reason). But Atlanta is favored to win at Cleveland, and the Eagles are favored to win at home against Dallas. A loss could also drop Seattle behind Green Bay in the playoff standings. The Packers are 3-4-1 but are 10-point favorites against Miami at home. If all those point spreads hold, then Thursday’s Seattle vs. Green Bay game could basically be a playoff elimination contest. The thought of the Seahawks being 4-6 and with low playoff odds entering Thanksgiving weekend is a little hard to grasp. And it’s a sight Wagner vowed won’t happen. “Definitely sitting at 4-4, you understand your mistakes are limited. You can’t throw away some of these games,’’ Wagner said. “We have a lot of home games (five of the last seven), which can definitely work in our favor. We have to start making plays. It’s not about the urgency. It’s one thing we should have regardless where we’re at in the season.